Want Straighter Teeth? Amherst Dental Group Can Help! If you’re dealing with crooked, crowded or gapped teeth, you don’t have to endure the stress or embarrassment of traditional metal braces. Invisalign is the subtle way to straighten teeth, and over 3 million people worldwide are enjoying better smile confidence as a result of this orthodontic system. Your Williamsville NY dentist offers the solution for teens and adults at Amherst Dental Group — keep reading to learn more about Invisalign! The Invisalign system is an orthodontic treatment that uses a series of plastic aligners to gradually shift teeth into their preferred position. Instead of metal brackets and wires attached to the surface of teeth, the Invisalign trays are clear and custom-made to fit snugly around your teeth. Each tray is designed to place focused pressure on a specific area, continually bringing the teeth into proper alignment. In the debate between clear and traditional braces, the one that’s right for you will depend on your unique situation. You should consider your lifestyle, profession, timeline and budget to make the best decision. So no, Invisalign isn’t necessarily better than traditional braces — but for adults and older teens looking for quicker results and a more discreet treatment, Invisalign is the clear winner. Your total treatment time will depend on your unique case and how severe your misalignment is to begin with. On average, the Invisalign treatment takes one year to complete. That’s about six months faster than the treatment time for traditional braces. Adults and teens who have good dental and oral health experiencing mild to moderate orthodontic issues are typically excellent candidates for Invisalign. 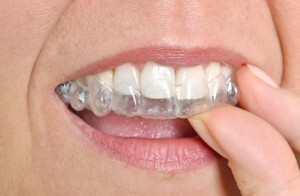 The only way to know for sure is to schedule a consultation with your nearest Invisalign provider. OK, who is my Invisalign provider? If you’d like to start on your better, straighter teeth, don’t wait to contact Amherst Dental Group. Your family dentist in Williamsville NY has been helping patients achieve amazing results with Invisalign for more than 14 years. Contact us to request your appointment today! Comments Off on Want Straighter Teeth? Amherst Dental Group Can Help!